Marion Blackiston-Houston, the daughter of Lilian Kidston, was married in 1929 to the soldier Gordon Holmes Alexander MacMillan. In 1952, he was discovered to be the MacMillan of MacMillan and Knap – the Chief of Clann an Mhaoil. Gordon’s army experience in Canada strengthened the relationship between the Clan Societies across Canada and Scotland. The estate itself saw the development of forestry activities alongside the letting of cottages. The nursery garden set up by Marion and the herbacious border added in 1939 and continued extensive planying, has gained a reputation recognised under the Scotland’s Garden Scheme, whilst the public benefited from the sale of fresh vegetables grown on the estate. Their son, George Gordon MacMillan inherited Finlaystone in 1955, and married in 1961 to Jane Spurgin. With Jane’s background in botany and social work, the wider estate opened to the public in 1975 as a paid attraction followed by the introduction of the Ranger service in 1976. During the 1980’s the development of visitor facilities included the building of the Visitor Centre, public toilets, play areas and tearoom. With his background in teaching, George began the development of an educational focus for the estate. The management of the estate grounds became more long-term focused with a consideration to the environment and wildlife, providing associations with Scottish Natural Heritage and RSPB. 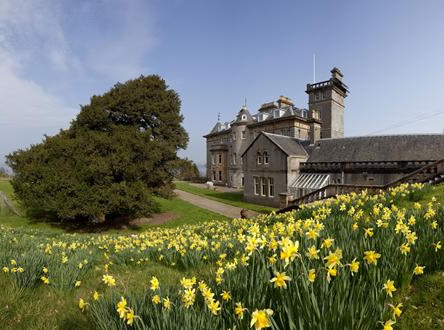 Finlaystone House provided the perfect setting for a wide range of concerts and orchestras and through the Historic Houses Association a demand for group tours. George and Jane’s eldest son, Arthur, became Chief Executive of the Clyde Shipping Company (now Clyde Marine Company) in 1995 and now owns the house. Arthur his wife Barbara and two sons live there. The estate has now become one of Renfrewshire’s most popular paid visitor attractions. You can find out more about the Clan MacMillan here.